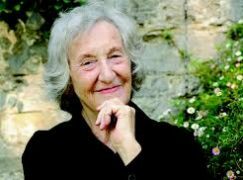 The composer Thea Musgrave, who turns 90 on May 27, will mark the day with a concert at the Church of St. Mary the Virgin, New York City. Thea has written more than 160 works, including 13 operas, and she’s not done yet. The concert will include the world premiere of La Vida es Sueño, sung by the Mexican baritone, José Adán Pérez, and the US premiere of Dawn, performed by Nicholas Daniel. Is anyone in Britain marking Thea’s 90th? Indeed so… and plenty more to be announced soon! Many happy returns, Thea! And may you keep on composing such wonderful works as your Horn Concerto and the opera Mary Queen of Scits. “Scots”, s’il vous plaît! But yes, many happy returns to her indeed – and posting of one of her finest works, the Clarinet Concerto, here is most welcome (I’ve not heard it in years!). Indeed a strong work… she should be much more known, instead of people like Birtwistle, Benjamin or Ades. All four are fantastic.And Turnage,too.And MacMillan too.And many more,in Great Britain. Not Turnage please…. awful aural populism. But also truly excellent composers of great gifts: David Matthews, Peter Fribbins, Alan Mills (is N-Irish actually), James Francis Brown, Matthews Taylor, Sally Beamish, John Kinsella (actually Irish). Modernism only had a quite restricted influence on the British isles, probably because of not having been occupied in WW II and thus, not feeling obliged to totally reject tradition because Hitler loved it so much. Musgrave is a world treasure, who’s works have been sorely neglected. I year long celebration of her work is just the thing that is needed. Yes, if she was less artistic and more demanding of attention, then we might not hear so many complaints about the lack of woman composers. She’s been quietly doing it well for decades. Actually Norman, you should have checked Thea’s website — http://www.theamusgrave.com/performances/ — there are many UK performances of Thea’s music this season. Congratulations THEA — LONG OVERDUE! Where are the recordings? Her Mary Queen of Scots is highly regarded but there’s only one recording, intermittently available. Iain Hamilton’s Catiline Conspiracy, Royal Hunt of the Sun – not even recorded. There are many tempting “Scottish” operas but nothing to show in the recordings. Yes! Leicester International Music Festival (mine) is having. Thea as featured composer and she is coming, BBC Scottish is also celebrating with Dame Evelyn and me, and there’s already been a big Manchester bash.